Facebook never sleeps. Turn your head for a minute or two and they’ve changed, added or improved something. Just past its 13th birthday, it makes sense that a company with such an insatiable demand for growth is never static. The latest batch of changes has the potential to directly help those in the hospitality business, especially small hotel or B&B owners. These new features are generally aimed at improving user experience, but a lot of them also open the door for hotels to find new ways of connecting with people. Facebook events are nothing new. In fact, they date back to the early days of the platform. But what is new is a specialised events app that streamlines the process for locating and responding to events. This app lets people view invites from friends and even search through public events. Hotels can use this feature to create and promote events to targeted audiences. This is likely one of the cheapest and most effective ways to reach people who might be interested in an event at your property. Also, using the events app as a consumer allows a hotel to make cool and unique recommendations to guests. As reported by Adweek, FB has launched a set of tweaks to its photo albums which gives users a newfound ability to interact and create content. Albums now support video, check-ins and text posts. Users can also highlight an album more prominently on their homepage if they like. Hotels can use this feature to spice up albums posted on their business page, and knowing that it’s easier than ever to share content they can strive for status update-worthy experiences. For example, adding an Instagram frame (physical one) to the most picturesque part of your property may encourage guests to take and share photos. People have long turned to FB friends to find a good dentist or ask if a Kindle is worth buying. Now, this process is more streamlined than ever. When a recommendation is given, the information is now clearly mapped out for you so it’s easy to digest at a glance. Hotel operators can use the recommendations tool to keep better tabs on the online conversation happening about their property. It also increases the pool of potential guests. 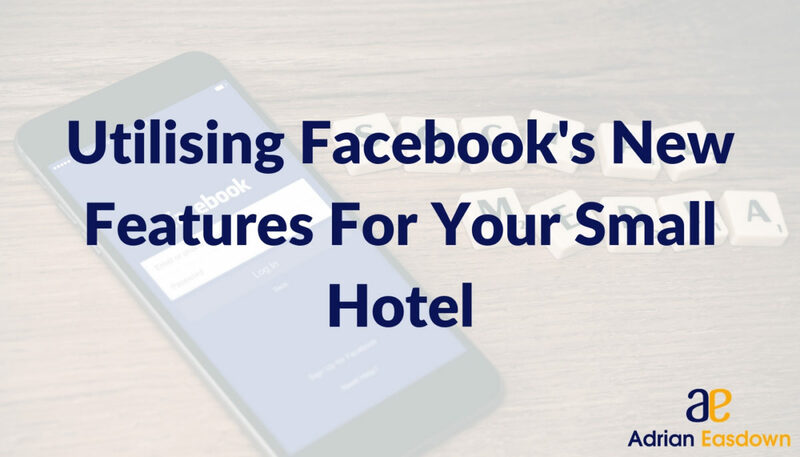 Additionally, many hotels have installed a booking portal onto their Facebook page which drives direct bookings, encourages guest engagement and builds brand awareness. The state of social media is constantly in flux so the best strategy follows suit. Constantly updating and revising your approach may seem like a headache, but it’s what the most successful brands are doing, and knowing about these changes as they come down the pipeline is one of the keys to staying relevant.